What wonderful weather! When I finished work on Tuesday, I endured the long and painful commute from work to home (a five minute walk through the site and along a grassy bank overlooking the marina) to find tables and chairs set up on the peninsula next to the boat with a clear view of the water fowl relaxing on the island. Sally brought our our evening meal, spicy lamb and rice followed by raspberry and mango cheesecake and fresh raspberries, which we eat in a contented silence as we listened to the squabbling birds and the soft breeze gently rustling the head high reeds. The tranquility was marred ever so slightly by the annoying drone of microlight aircraft constantly taking off from a field close to the marina, doing a ten minute circuit of the area, landing and then repeating the cycle again. I’m very tempted to buy an air rifle and take pot shots at him as he passes. I suppose that’s not socially acceptable though. As the week progressed the weather became warmer but more unsettled. On Thursday with the temperature in the mid twenties both Pat and I looked for something to do in the shade. Pat spent the hottest part of the day under the willows overhanging the road up to reception, cutting them back to allow easier access for the high sided vans and lorries which deliver to us regularly throughout the day. I spent a very pleasant couple of hours in the cottage garden. The garden has a small orchard with half a dozen apple trees, a similar number of damsons, a too large pear and a magnificent walnut tree with a green painted bench built around the trunk. Sadly, the orchard, and the cottage garden generally, has been neglected over the last few years. The pear tree had been allowed to grow to about thirty feet and had stopped producing fruit. Last winter I cut the top five feet off the tree. This year, after many barren years, pears are hanging from the branches again. Unfortunately most of the fruit is still too high to reach. I’m going to cut another five or six feet off the top again at the end of this year. On Thursday I spent my time tidying the garden and removing excess tree growth. One of the larger damsons had grown over the slate roof of the byre which adjoins the cottage garden. I removed a couple of limbs to stop the roof from being damaged and then removed the lower branches from a forty feet high conifer which dominates the garden. I’ll be removing it completely at the end of the year but for now I just need to be able to drive around the trunk sitting on our Husqvarna mower without decapitating myself. There’s no rest for the wicked. On Friday, my day off, I spent a rather hot afternoon in Sally’s garden painting her fence, and reminding myself why I love living on my boat so much. The house is in a very pleasant residential area of Woodford Halse but it’s far too close to other home owners for my liking. I spent the afternoon listening to little Tommy tormenting his sisters in a garden paddling pool about fifty metres away. His mother’s parental guidance involved her leaning out of a bedroom window every five minutes and telling the neighbourhood what a naughty boy he was. Added to Tommy’s whining denials, his sisters’ screams and his mother’s shrill rebukes, I could hear the clatter of a group of teenagers practicing on skateboards on the road at the front of the house, groups of neighbours chatting at front doors, lawn mowers and hedge trimmers in nearby gardens, cars and motor bikes on the road and a host of other sounds typical of a quiet residential area. I hated it. For the last four and a half years, I’ve been used to hearing very little other than the natural sounds around me. At this time of the year the marina is at its busiest but even now it’s unusual to see more than half a dozen people a day walking by during the day. During the winter months weeks can pass without seeing anyone else at all near our floating home. I couldn’t wait to get back to the peace and tranquility. I was home by 7pm enjoying our evening meal under the shade of the cockspur thorn tree next to the boat, sipping a chilled Strongbow cider and watching the storm clouds build. For the previous two or three days the weather forecasters had been predicting torrential rain, thunder and lightning for Friday night. I was really looking forward to it. I love a good storm but we rarely experience one in this gentle part of Warwickshire. As the light faded we saw constant lightning flashes on the eastern horizon and the occasional muted rumble of thunder. We put our chairs and table away at 10pm, made sure that the covers were on the side and rear hatches, climbed into bed and waited for the show to start. As is often the case with extreme weather forecasts, very little out of the ordinary happened. We had a brief but reasonably heavy shower in the early hours, but that was it. Saturday morning was dull with frequent gentle showers but the rain was warm so we carried on working on the wharf hire boats in tee shirts anticipating further forecast torrential rain, but we didn’t get that either. One of the returning hire boat crews on Saturday morning was a man short. The crew was on one of our larger boats. At sixty feet long and about fifteen tonnes it’s not an exceptionally big boat, but it’s far too large for one person to deflect from a rapidly approaching wall without the aid of the engine. That’s what the missing crew member did. The boat’s bow was getting too close to the bridge side as the boat passed through the bridge hole so, we think, he stood on the bow and tried to push off against the wall with one foot. The foot he had on the bow slipped and he fell between the boat’s bow and the wall, just before the boat made contact with the wall. He’s broken a bone in his pelvis. It’s going to be a long time before he forgets the consequences of such a foolish stunt and the danger of getting between the boat and any other solid object. I recently told you about a problem I had with a failed hose. Roger Filler has kindly emailed me this useful tip for running hose repairs and another handy digital aid for boaters to add to last week’s collection. “Glad the hose/engine issue was resolved without too much cash. Here is a little inexpensive tip that will save you if you have hose issues again. Get yourself hose menders for each hose size you have at the DIY center along with a couple of hose clamps for each one. I have attached pictures for you. The clamps can be the normal type or the ones illustrated which are great for a quick no tools repair. How to use: Cut hose where the leak is, insert mender, tighten clamps and off you go. Done in a few minutes. If problem is at hose end cut bad end off (not too long) and insert hose mender if needed to make up length elsewhere in hose. It’s a permanent repair unlike tape. A real lifesaver if you have special shaped hoses that are only obtainable through the dealer. Perfect for the cruising spares kit. A few days ago I was asked what a weed hatch is for. I explained that it was to gain access to the propeller to remove stuff that gets caught on it. “So it’s not just for getting weed off then?”. If you are already a boat owner there’s a very good chance that you already know from personal experience that removing weed from your propeller is the least of your problems. I’m often asked by our eager and often novice hire boat crews how deep the canals are. They are usually surprised when I tell them that they won’t often have more than four feet of water under them and that quite often the depth can be as little as two feet of clear water and a couple of feet of silt under that. The shallow depth is enough of a problem for you as a narrowboat owner. Your boat’s draft, the distance from the lowest point on the boat to the waterline, will usually be somewhere between eighteen and thirty inches. My boat’s draft is thirty inches and as such is quite a deep drafted boat. On shallow canals such as the Ashby I can often feel the boat ploughing through the mud. On rural canals being in contact with the bottom is no more than an inconvenience. However, on urban waterways where the intellectually challenged oiks like to pass their free time throwing inanimate objects into the water, shallow depths can cause you a great deal of inconvenience. As your boat cruises along litter infested urban waterways, the boat’s thick steel bottom passes without harm over protruding objects but the propeller, protected only by the skeg, a narrow steel bar running underneath the propeller from the boat’s base plate to the rudder assembly, often catches the obstacles as they spring free from the weight of the boat passing over them. Weed, unless it’s particularly thick and fibrous, isn’t a problem. The difficulty you’ll face is with just about every other man made object which finds its way into the canal. You’ll encounter fishing line complete with hooks, rope, plastic bags, every item of clothing under the sun, mattresses and duvets, three piece suites, shopping trollies and bicycles by the score, odd bits of wood and plastic and, if you’re particularly unfortunate, a rotting animal carcass or two. With regard to unpleasant encounters with the weed hatch, we are very fortunate here at Caluctt Boats. We are on the Grand Union deep in rural Warwickshire. We are eight miles east of Leamington Spa, twelve miles south east of Coventry and thirty miles south east of Birmingham. The first opportunity to meet Neanderthal canal side revelers to the south is by travelling thirteen miles, two days by canal, south to Banbury. The usual routes for our holiday hirers are down to Oxford and back on the south Oxford, up the north Oxford, onto the Coventry and then up the Ashby canal and back, along the Grand Union Leicester line to Market Harborough and back or around the Warwick ring. With the exception of some parts of Birmingham on the Warwick ring, our hire boat crews rarely have to dive down the weed hatch. We brief them on the correct procedure anyway. This is what we tell them. The first thing you should try is to put the boat into reverse and give it a quick blast to try and throw the obstacle off. If this doesn’t work you’ll have to roll your sleeves up and get down and dirty. Pull over to the bank and moor your boat. Turn the engine off and make sure that everyone is aware that you are going to have your hands wrapped around the propeller so the engine mustn’t be turned on while you are down there. With our often novice hire crews we suggest that the weed hatch diver puts the ignition keys in his or her pocket to ensure that that doesn’t happen. The weed hatch will have a locking bar or clamps securing it in place. Undo the retaining screws (you may need to give them a tap with your mooring lump hammer to free them), slide the locking bar out and then lift the weed hatch cover out of the way. You will now see a square or rectangular opening through the bottom of the boat to the water. Carefully reach down into the water and feel for the propeller. I emphasise “carefully” because you don’t know what you’re going to encounter. Obstructions can include barbed wire and fishing line complete with hooks. Because the routes out from Calcutt Boats are usually on rural and debris free canals we don’t have any tools on board for cutting away obstructions. We suggest that they use the serrated bread knife from the galley to cut any obstructions away (and to clean the bread knife using boiling water after they’ve used it). Once the obstruction has been removed, replace the weed hatch lid and locking bar, make sure that the locking bar is secure and check that you have a watertight seal before replacing the deck board. If you don’t have a watertight seal, as soon as the boat is in motion, water will find its way from the canal into the engine bay, often with disastrous consequences. An easy way of checking the seal is to start the boat, put it into gear and give it a quick blast. The spinning propeller will throw water against the underside of the hatch and reveal any leaks to you. If the hatch is sitting in the correct place but there is still some water making its way into the engine bay then you may need to replace the tape around the edge of the weed hatch. Our hirers don’t have any tools on board for dealing with more challenging items than fishing line, rope, plastic bags and clothing, but I’m sure you will want to have a full range of weed hatch tools available if you plan to explore the network. Here’s what I have on board. You won’t always be immersing yourself elbow deep in the blood warm water of a summertime canal. Sometimes you’ll be delving into frigid water for longer than you would like. Your hands will be numb and you’ll usually be working in murky water on something you can’t see, often at an awkward angle. You will drop one or more of your tools at some stage. I tie a loop of parachute cord around each of the tools I use in the water to use as a handle. If the handle fails or I’ve forgotten to tie one on in the first place, I can always go fishing with my recovery magnet. Last but not least, make sure that you wash your hands and arms once you’ve finished. You don’t want to contract Weil’s disease from infected rat urine. 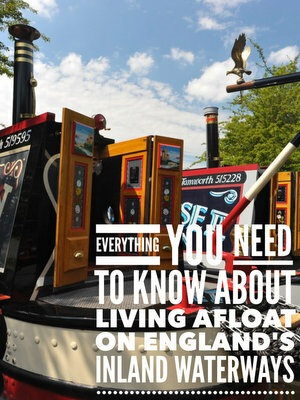 Scared senseless at the prospect of cruising the inland waterways now? Don’t be. Some boaters very rarely pick up debris. In fact, fellow live aboard Tim Wood has been a continuous cruiser now for eighteen months and hasn’t yet needed to open his weed hatch at all. One final suggestion for you, if you haven’t yet bought your boat, make sure that your intended purchase actually has a weed hatch and if it does that the hatch is easily accessible. The only alternative to using the weed hatch to access the propeller is to jump into the canal to deal with the obstruction and, as you won’t be able to reach the propeller when you’re standing in the water next to your boat, you’ll have to hold your breath and duck your head under the murky surface to get close enough. You don’t want to be doing that! The Pearson and Nicholson guides to the inland waterways are invaluable for route planning, locating facilities on your route and determining to a certain degree where the best places are to moor for the night. However, they often lack the additional information which you need to ensure that your cruise is both safe and problem free. The cruising guide section of the forum is home to a growing number of detailed cruising guides written by experienced boat owners. The latest guide was emailed to me by Roger Filler last week. I’ve just posted it here on the forum. If you’re thinking of tackling the Leeds Liverpool canal, Roger’s notes will come in very handy.